ECHO is out in paperback! 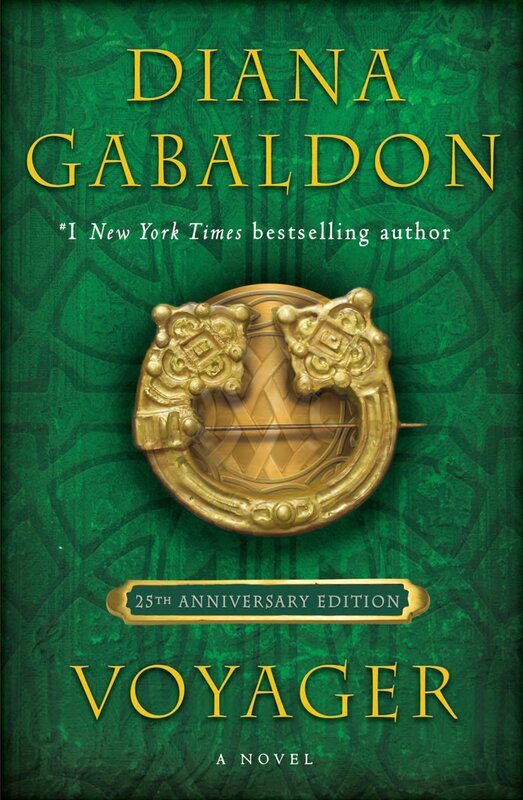 Audible.com is offering a FREE download of the unabridged audio version of Diana Gabaldon's OUTLANDER (among other books), through July 2, 2010. UPDATE 7/3/2010 2:50 pm: The offer is no longer available. Sorry! Welcome to Audible.com's Summer FREE Audiobook Giveaway! We're offering some of the season's top titles, along with a number of our best-sellers, absolutely free with no strings attached. This is your best opportunity to try an audiobook absolutely free and kick-start your summer with a great book. Choose 1 FREE audiobook on us. There is no credit card required to participate. 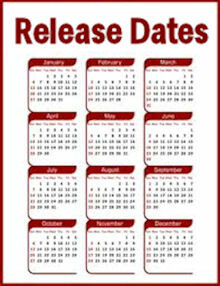 This event ends July 2, 2010, at 11:59 PM EST. The link is here. Thanks to Jennifer on MyOutlanderPurgatory for the tip! If you haven't listened to the UNABRIDGED audiobooks read by Davina Porter, I highly recommend them. And it's free, so what are you waiting for? <g> This is a perfect opportunity, if you act fast. For more information about OUTLANDER audiobooks in general, look here. There's a YouTube interview with Davina Porter here. I was really surprised to see this post, as there hasn't been anything new on that site in maybe six months. I stumbled on it purely by accident, looking for something else. Just thought I'd pass it on, in case others are interested. I have never been to a Highland Games myself, but I'd like to do that some day. What about the rest of you? Are there any particular Highland Games that you attend regularly or would recommend to others? Any stories about them that you'd care to share with the rest of us? It's priced VERY cheap for its size -- this is a coffee-table book, but it cost me only about $13.00. I suspect it's about to go out of print, because it was originally published in 1998 and there are hardly any reviews of it in places like Amazon.com. 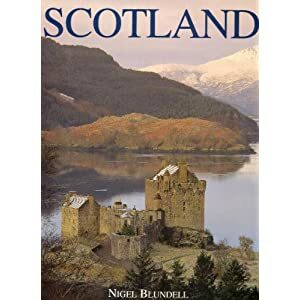 The second section, by far the largest part of the book, is devoted to Scotland's history, going back at least 1000 years, lavishly illustrated with paintings, etc., depicting the various historical events, and many photographs of the places involved. I learned a lot from reading this section of the book, though it was a bit too long. I really enjoyed seeing the pictures of the standing stones of Callanish in Chapter 4. Would love to see them some day! I was particularly struck by the story of the Glencoe Massacre of 1692, the details of which I had not heard before. It was much more horrific than I had realized! My biggest complaint is that the book has more than its share of typos and editing errors. But the pictures are wonderful, and as I said, you can't beat the price, so if you're interested, you can order the book on the Barnes & Noble site, here. It's listed as a "Clearance Sale" item at the moment, but I don't know how long that will last. If you have any other recommendations for good general books about Scotland (with pictures! ), please post them here. SPOILERS below! Don't read this unless you have seen the EXILE preview! 1) No wonder he's so suspicious of her. Wary, even. He's sworn to protect Jamie. If he thinks Claire is a faery, presumably he'll do anything he can to protect Jamie from her. 3) Think about Jamie's reaction right after Claire tells him the truth about where she comes from. He sits there without speaking or moving for a long time. What's he thinking? Is it possible he's remembering Murtagh telling him that he'd seen Claire appear out of nowhere from the stone circle, and now realizes that Murtagh hadn't been imagining it? 4) At the Abbey, after Wentworth, when Jamie begs Claire to leave him and go back to her own time, he says Murtagh will take her back to the stones. "I've told him." What, precisely, did Jamie tell Murtagh? When did they have this conversation? Can you imagine Jamie telling Murtagh, "'When I'm dead, you must take Claire back to Craigh na Dun and....leave her there." It makes no sense at all, from Murtagh's point of view, UNLESS he already saw Claire emerge from the circle. 5) Fascinating to think that Murtagh knew something so important about Claire long before Jamie did. Did Murtagh tell anyone else (like Colum or Dougal) what he had seen? All speculations and wild theories welcome! I'd like to know what the rest of you think. I picked up my copy of the new ECHO trade-paperback (for those of you who don't know, that's the larger size paperback) at Borders yesterday. Yes, the cover is VERY, um, green. <g> (Diana refers to it jokingly as the Green Slime, and the nickname is sort of catching on.) No question, if the intent was to make the book easy to spot on a table, it worked. The color actually looked much better when I got it home (more subdued, once it was out of the bright lighting in the bookstore). EXILE SPOILERS below.....don't look if you don't want to know yet! First, a general comment. The lettering (of the dialogue, etc.) is quite beautiful, and I liked the "ribbon" effect used for the occasional bits of narration. For someone like me, who's not familiar with graphic novels, that was a pleasant surprise. I guess I was expecting comic-book-style lettering, in all caps, that sort of thing. This is much better than what I had been picturing. Page 3: BJR is unmistakable, at the bottom of the page. My instant reaction was, "He looks mean!" And then a moment later I realized who he was. I love the detail on the dragoons' helmets. All of them are just slightly different, which surprises me a bit. Very realistic-looking, though. Page 4: I like the way the Gaelic expression is footnoted at the bottom of the panel. You don't really have to take your attention away from the action in the scene in order to read it. (I had thought the footnotes might appear at the very bottom of the page; this is better, I think.) And I also like the way this scene explains why and how they came to be at the cottage in the first place. I liked that view of the inside of the cottage very much (the next to last panel). Page 5: Seeing Craigh na Dun from a distance like that really reinforces the idea (visually, I mean) that the circle is located high up atop a hill. I'm very curious about Murtagh's reference to an "evil dream" in the third frame. (Wait and see, I guess....) Just a wild speculation here....but Jamie has been known to have premonitions, dreams about the future, etc. Is it possible that he dreamed about Claire before he met her? How's that for a bombshell?!? Murtagh saw Claire come through the stones. No wonder he's suspicious of her from the very beginning! I will save my speculations on this point for later, when I've had time to think through all the implications -- but it's very intriguing! Page 6: I loved Claire's line "Where the bloody hell did I leave the car?" That made me laugh. Her personality comes through loud and clear from the moment we see her here. <g> And BJR does look handsome in this shot, which seems right. Page 7: For all the talk about Claire's hair over the last couple of years (on Diana's blog, and in this thread from 2008 on Compuserve), it looks right to me on this page. The fourth panel, especially, looks like what I imagined. Curls erupting in all directions <g>, and the color seems right. I love the way her eyes bulge with shock and outrage when he kisses her. His response--and the reference to "the faery's mate" will all be perfectly clear when you see what happened on the pages prior to this one. I've pre-ordered a signed copy of THE EXILE from the Poisoned Pen bookstore, and I would encourage any of you who are interested to do likewise. The link is here. They ship anywhere in the world. The discussion about the EXILE preview on Compuserve is here, if you'd like to tell Diana what you think. She's always very interested in hearing from her readers and fans. I saw this article in today's (June 22) Raleigh [NC] News & Observer and thought others might be interested. This is probably not the same swamp that William got lost in, in ECHO (I think he was closer to the NC-Virginia border, whereas this article is talking about a swamp in present-day Bladen County, NC, in the southern part of the state), but the pictures and video make it easy to imagine what it must have been like. 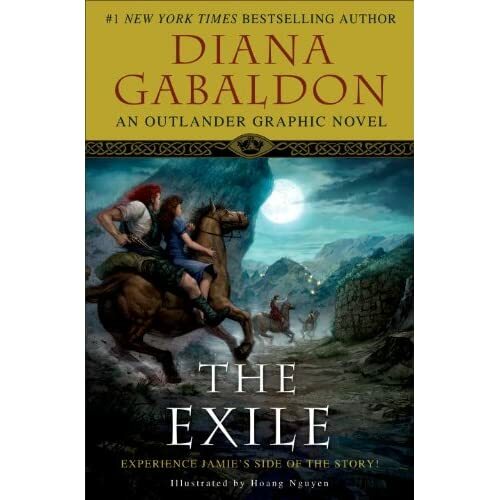 This trade-paperback edition includes an eight-page preview of the upcoming OUTLANDER graphic novel, THE EXILE (due out on September 21, 2010). UPDATE 6/23/2010 7:49 am: If you want to see my detailed reaction to the EXILE preview, look here. For more information about THE EXILE, look here. Diana Gabaldon was released from the hospital late Friday afternoon, a day ahead of schedule, and she is doing well so far. But you don't have to take my word for it! Check out her latest blog entry, here. It sounds like all the positive thoughts, prayers and get-well wishes from Diana's fans all over the world have been helping a great deal. She said on Compuserve yesterday that she's able to walk "pretty normally, just slowly", without needing even a cane for support, though she's still under the influence of some pretty strong painkillers. I recently returned from visiting my sister and her family in Israel. While I was there, I picked up a copy of the Hebrew translation of OUTLANDER, titled "Nochriyah" (which, I'm told, means "outlander"). Here is part of the description from the back cover of the book. קלייר רנדל מנהלת חיים כפולים. יש לה בעל שחי במאה אחת ומאהב מן המאה האחרת. כשקלייר רנדל, אחות קרבית לשעבר, חוזרת בשנת 1945 מהמלחמה ומתאחדת עם בעלה לירח דבש שני, היא נוגעת בתמימות בסלע המצוי באחד ממעגלי האבנים העתיקים הפזורים ברחבי האיים הבריטיים. Roughly translated, it says, "Claire Randall is living a double life. She has a husband in one century, and a lover in another. When Claire Randall, a former combat nurse, returns in 1945 from the war and reunites with her husband on a second honeymoon, she innocently touches a rock found in one of the ancient circles of stones scattered throughout the British Isles. In a moment she returns to the past, to the Scotland of 1743, a war-torn land of border disputes between clans." Have any of you read Diana's books in another language? If so, are the translations accurate, or not? Any odd word choices or mangled phrases that you'd care to share with us? Do the translations make any attempt to convey the Scottish accent or the Gaelic phrases? Is the whole text of the story included, or do they leave out any important parts? I'm particularly interested in hearing from those of you whose first language is not English. Have you read OUTLANDER (or any of Diana's other books) in your native language, and if so, what language was it, and what did you think? Do you prefer to read it in English or in another language? Just curious what others have to say about this. 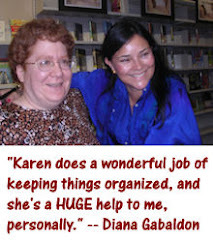 Diana Gabaldon has updated her blog with more details about her knee replacement surgery, scheduled for today, June 17. We'll all be thinking about Diana today and wishing her well! UPDATE 6/19/2010 2:10 am: Diana was released from the hospital on Friday, slightly ahead of schedule. I'm sure we'll be hearing more from her soon, once she gets a chance to rest and recover a bit. For those of you who haven't already heard about this....Diana Gabaldon is having knee replacement surgery on her right knee on Thursday, June 17. There is a thread here on Compuserve if you want to send her good luck or get-well wishes. She says she expects to be in the hospital only a couple of days, if everything goes well. Wishing Diana the best of luck with the surgery, and let's all hope that she makes a quick and complete recovery! 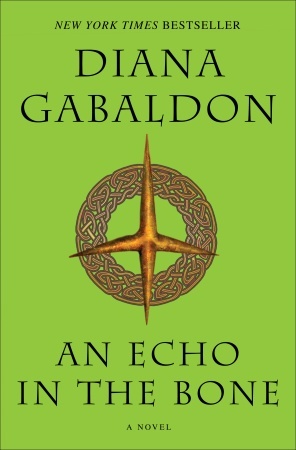 In honor of the June 22 release of the trade-paperback edition of AN ECHO IN THE BONE, which will include an eight-page preview of the upcoming OUTLANDER graphic novel, THE EXILE, Diana Gabaldon has posted a new page from THE EXILE on her blog. This page is the first one we've seen that includes dialogue bubbles as well as artwork. 2) I was sort of startled by the size of Angus's fist in that first frame. I knew he was a big guy, of course, but hadn't really pictured him as being quite that large. <g> No wonder Claire was worried! 3) Laoghaire looks more or less exactly as I'd imagined. 4) Yes, I do think Jamie's ears look too pointy in the last frame, despite what Diana said on her blog ("And no, Jamie doesn't have pointed ears; his hair is just overlying the top of his ear.") I'll have to reserve judgment on that until I see the rest of the GN. Diana announced this week that the story she is writing about Marsali's sister Joan and young Ian's brother Michael has a title. It's called "Terror Daemonium", a phrase that apparently comes from the litany of St. Joseph. (I say "apparently", because I'm not a Catholic and I don't really know what the litany of St. Joseph is. <g>) The Latin phrase translates as "Terror of Demons", or something like that. The excerpt, and discussion of it, is on Compuserve here. There is also an earlier discussion about this story on Compuserve, here, if you haven't already seen it. I believe the anthology in which this story will appear is called DOWN THESE STRANGE STREETS, but that is all the information I have about it at this point. As soon as I find out more specifics, I will post them here. Please keep in mind that I am (mostly) an excerpt-avoider. If you want to discuss the specifics of this or any other excerpt from one of Diana's unpublished books or stories, please post on Compuserve or the LOL Excerpt Board. Thanks. Check out Diana Gabaldon's latest blog entry, which is all about her recent visit to North Carolina, during which she spent some time walking battlefields at various Revolutionary War sites. Very interesting comments! I have never been to the battlefield at Guilford Courthouse, NC, but it's not far from where I live, and now I'm thinking I really should go visit it sometime soon. If any of you have been there, or to any of the other battle sites featured in the OUTLANDER or Lord John books, feel free to post your own impressions here. It looks like the comments feature is still turned off on Diana's blog. unfortunately, so you can't comment there directly. But if you want to tell Diana what you think, there's a thread on Compuserve, here. If you are interested in more of Diana's thoughts on this subject, check out the podcast she did in October, 2008. What did you think of Diana Gabaldon's latest story, "The Custom of the Army"? 29.4 % - I haven't read it yet, but I'm planning to. 19.3 % - I haven't read it. I don't want to buy a whole book just for one story. 15.6 % - I loved it! 12.8 % - I enjoyed it, but I wish it had been longer. 6.4 % - I'm not interested in reading about a gay character. 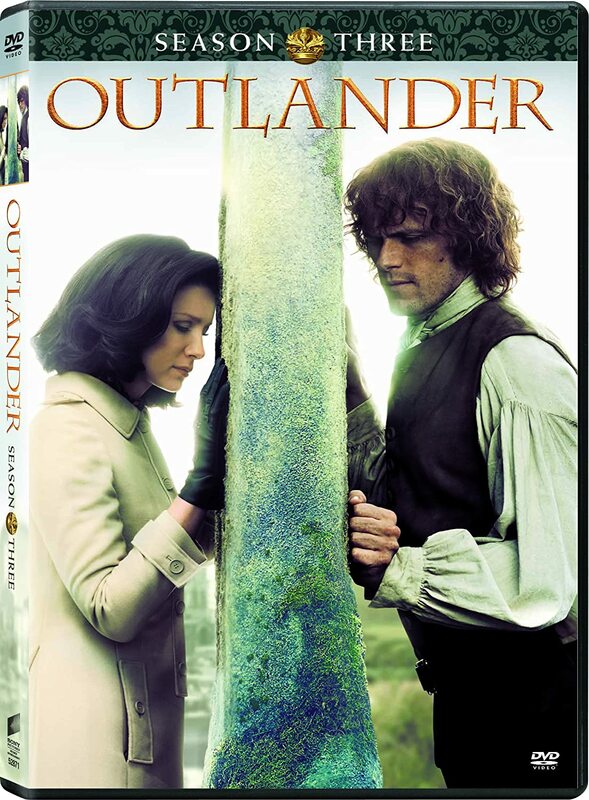 3.7 % - I liked the way the story filled in some of the missing pieces from the OUTLANDER books. 3.7 % - I liked seeing Lord John's relationship with Manoke. 1.8 % - I didn't like it. 1.8 % - I liked the electric-eel party that opens the story. 0.9 % - I enjoyed seeing Lord John in Quebec, and at the Plains of Abraham. There were 109 votes total. Thanks to everyone who participated! I didn't vote in this poll, but if I had, I would have gone with "I loved it!" I thought this story was really quite entertaining, and I would encourage those of you who haven't yet read "The Custom of the Army" to give it a try. The new poll for June should be a little more fun. It's all about your favorite "mmphm" scenes in the OUTLANDER books. <g> It was hard to pick only one per book, so the ones listed are my personal favorites. Feel free to comment here if you have another favorite that's not one of the choices in the poll.